For the last two years, the Bromleys of Blyth have been building an ice rink next to their Hamilton Street residence to bring skating close to home. Shawn Bromley explained that his son, Murray, was already skating and he and his wife Lisa were just starting to broach skating with their daughter June, so the timing made sense. He said that investing in skating lessons that his children may not be interested in didn’t really appeal to the family, so it made sense to try and do it at home. With a home rink, the children can skate when they want to without Shawn or Lisa having to worry about scheduling lessons or travelling. 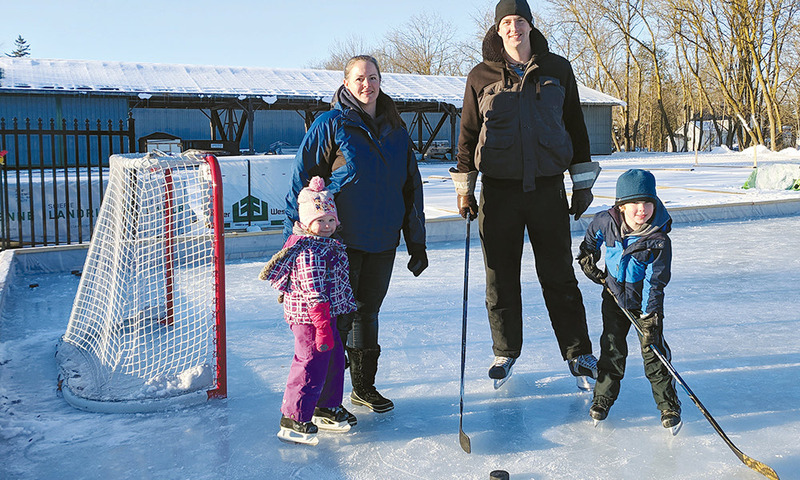 The Bromleys bought a small strip of land beside their house a number of years ago, which ended up being a nearly perfect home for the rink. Shawn, having grown up with a rink beside his house, figured that they could manage building the rink from there. That sentiment doesn’t mean there hasn’t been a bit of a learning curve, Shawn said. While he originally thought the plot he had chosen for the rink was more or less flat, he discovered, with his first rink, that there was a grade to the lot. At the end of the first year, he had nearly a foot of ice at one end of the rink and less than half a foot at the other, due to the grade. “That one end didn’t thaw until April,” he said. The 2017/2018 winter season was an ideal one for the family’s first rink, Shawn said, as the cold weather set in and stayed for a few months. He said this year won’t be as lucky, as December wasn’t very cold. “We’ll be lucky if we get a month out of it,” he said.